I love baking shortbread cookies. They are so buttery and flaky. The perfect grown up cookie! 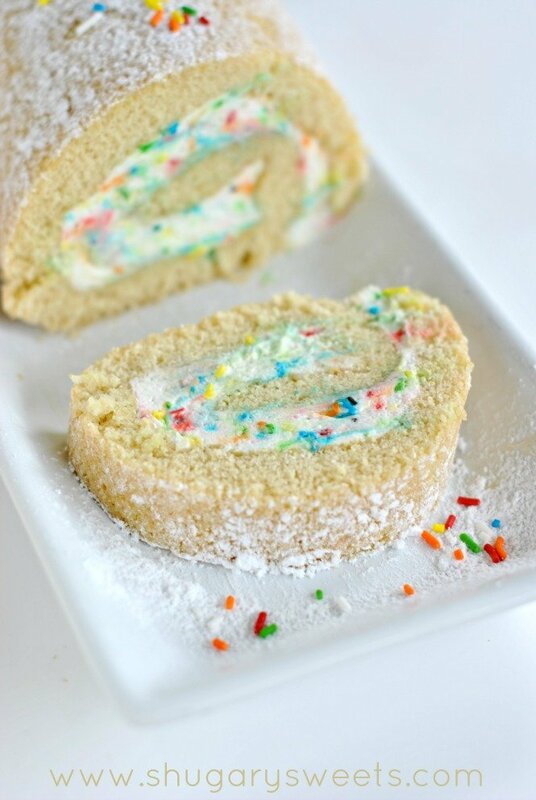 Add some sprinkles and they become totally kid friendly too! 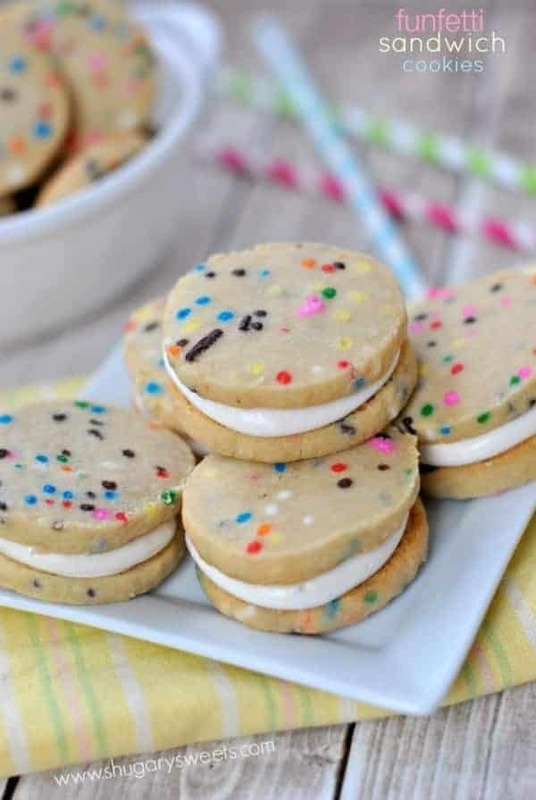 I filled them with a creamy cookie filling that adds a little extra sweetness. 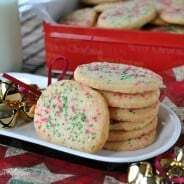 Shortbread cookies are not traditionally super sweet cookies, so this filling doesn’t put these over the top at all. Just brings them up to the rim! There’s something about sprinkles that makes me smile. No matter the day, no matter the circumstances, sprinkles have a way of bringing cheer. 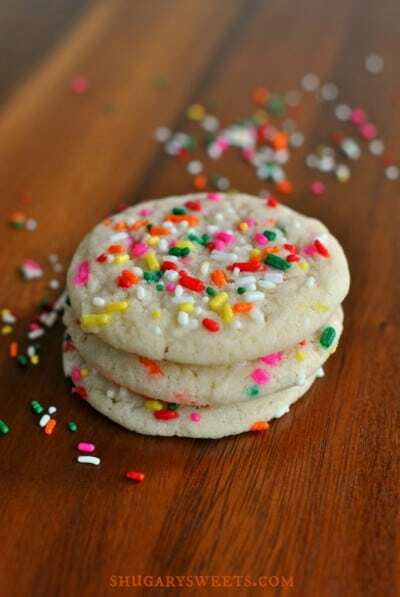 Rainy days don’t even hold a candle to some sprinkle cookies! The best thing about shortbread cookies is you can make them in advance and freeze the dough. I like to roll my dough into a log shape and wrap it in plastic wrap. I then use an empty paper towel tube, sliced down lengthwise, to hold the roll of wrapped dough. This helps it keep it’s shape in the freezer. When you’re ready to bake the cookies, remove from the freezer, unwrap, slice and bake. Add a few minutes extra if the dough is frozen. Or you can thaw the dough overnight in the refrigerator. I usually bake it straight from the freezer (and add extra time). It’s perfect to keep several flavors on hand in the freezer for those last minute cookie emergencies. You know the ones. Unexpected coffee guests? 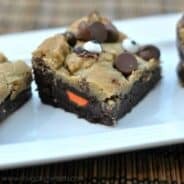 Sweet tooth cravings? Emergency lunch snacks for the kids! Frozen cookie dough to the rescue! Don’t want the filling? These are still delicious shortbread cookies! For the cookies, cream together the butter and sugar until fully combined. Add flour and salt until well blended. Add butter flavoring and sprinkles. Lay a large piece of plastic wrap on the counter. Drop dough into wrap and shape into a log. Wrap up in the plastic wrap. Slice an empty paper towel tube lengthwise and place dough in tube. Freeze for 30 minutes (or longer). Straight from the freezer, slice thin and place cookies on parchment paper lined baking sheet. Bake in a 350 degree oven for 10-12 minutes. Cool completely. Store in airtight container. If desired, add filling. For the filling, beat marshmallow cream with butter, vanilla, heavy cream and powdered sugar. Beat for about 3-4 minutes. I put this in a small ziploc bag and cut off the corner. Pipe onto center of each cookie, top with second cookie. ENJOY. I use butter extract to enhance the flavor of these cookies. Totally optional. Love SPRINKLES? Here are a few of my favorite recipes with Sprinkles! 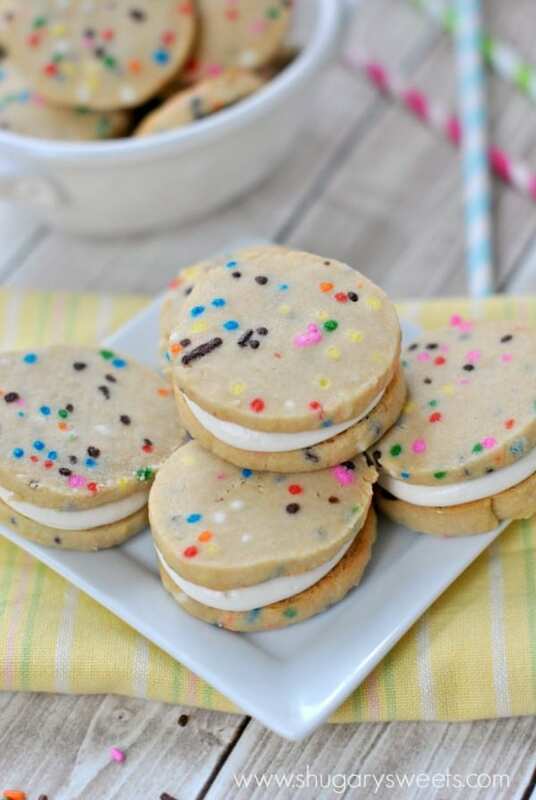 Funfetti Sugar Cookies. 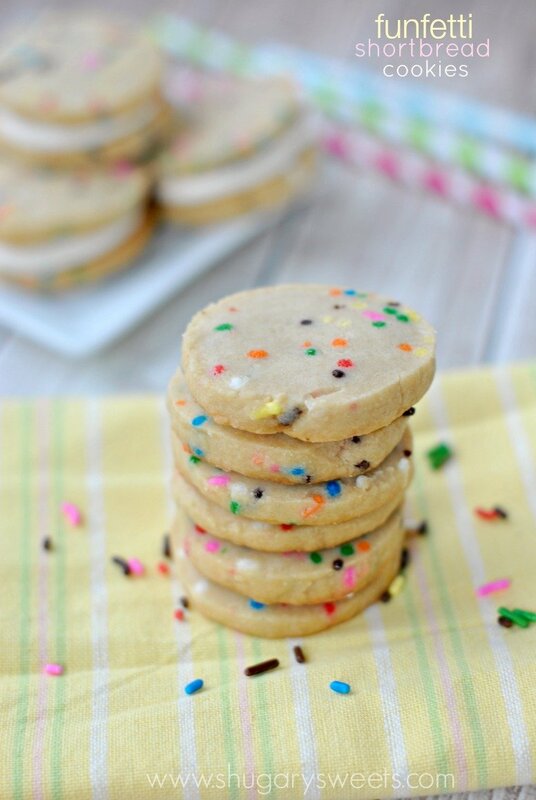 Simple, chewy cookies with sprinkles! 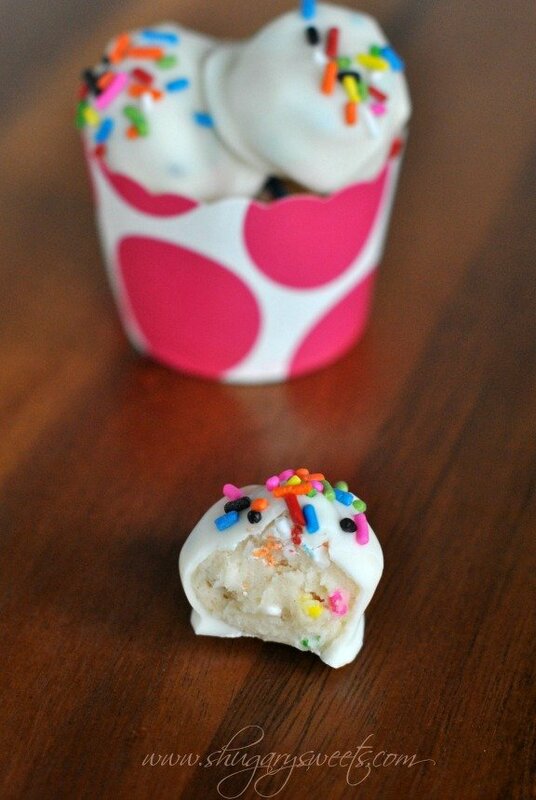 Funfetti Cookie Dough Truffles: delicious bite sized cookie dough treats, safe to eat! Vanilla Funfetti Cake Roll: vanilla sponge cake with extra sprinkles! Those cookies are looking so fun and festive! Perfect for a summer day while reading a book! I wish I had a log of that dough laying around right now 🙂 These look incredible! Love the sprinkles & pinned! Funfetti does make everything better! Logs of sugar cookie dough are my idea of comfort food! 🙂 Pinned! Wow, at least three amazing things going on at once! 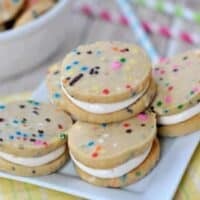 Shortbread, Funfetti, and marshmallowy filling! I love this! the sprinkles def. make these look so happy! And that filling looks positively dreeeeamyyy!! Mmmm overall just awesome cookies! These cookies are seriously celebration cookies but I would eat a dozen everyday. Celebrations should be a daily thing anyway right? 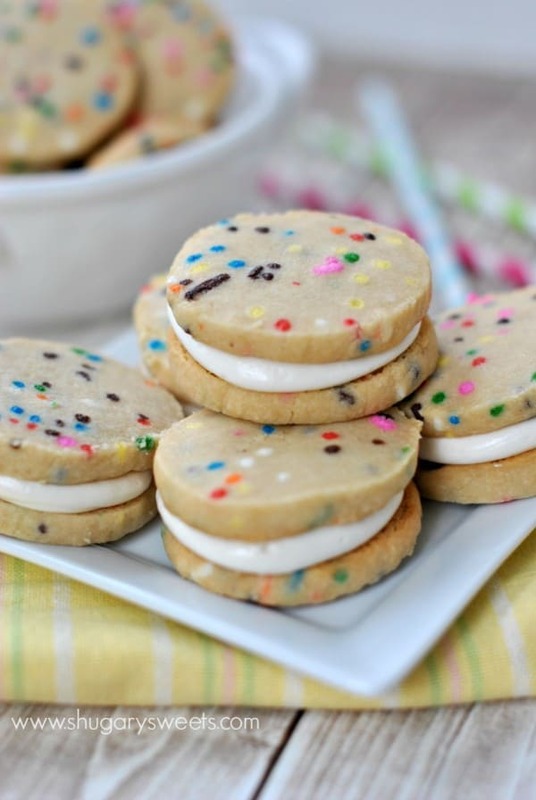 These are such fun little shortbread cookies, sprinkles definitely make everything better! They would be perfect for a birthday party! Pingback: some good reads, 5.19.14. | girl meets life. Well aren’t these the cutest shortbread cookies! 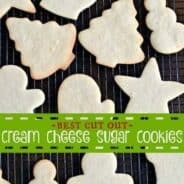 I love that you used them to make cookie sandwiches; so unexpected with shortbread cookies but DUDE A GREAT IDEA! I think there’s a problem with the ziplist link. When I try to add it, it adds “salads and sides” to the ziplist! Not even close to cookies! Hmmm, seems to be working okay for me! Sprinkles do make everything that much better…so does marshmallow filling!! These are the cutest little sandwich cookies. I wish my freezer was stocked with cookie dough for snacking emergencies…I guess I should get on that! Pingback: Quiz: What Kind of Cookie are You? This dough is super dry and crumbly. I had a heck of a time trying to get it into a log. It just kept falling into bits. Shortbread dough can be quite finicky. However, if my hands are warm, it comes together with no problems the more I keep playing with it. Make sure your butter is completely room temperature and that you add exactly the amount of dry ingredients, no extra!